I have a laptop having windows 7 installed.It has a RAM of capacity 4GB. Everything was working fine but from last couple of days, it hangs too much and becomes unresponsive most of the times. I am unable to move my mouse cursor. After checking the processes list, I came to know that "svchost.exe" is consuming most of the RAM and is the only cause for hang and unresponsive screen.Is there any way to stop it from working? If yes then how? Please reply as soon as possible. The problem is a deep rooted one and not rare to find, reason of which may vary depending the cause, but try the following. svchost controls a lot of things, try ctrl + alt + delete > task manager > File New task run > explorer.exe and see if that works. some viruses masquerade as svchost.exe, and run constantly to eat up your RAM so you should make sure you're not infected and clean with a good antivirus as soon as possible. how much RAM is taken up by the process, and which DLLs are loaded by it. Then, you can control whether individual services auto-start in the Windows services control panel which I think you can get to by Start then click Run "services.msc" or if that doesn't work Start → Run "msconfig" and that tool has a "Services" tab if this is Windows XP Service Pack 3. Windows Update should have all sorts of settings allowing you to control when and how often it runs. If nothing is found and/or the svchost.exe still uses high memory % then please post a log from HJT so I can see if there is anything suspicious lurking in your system. If I find anything you will have to go to the Malware forum for further assistance. When the TrendMicro HJT install box appears, double click on the HJTInstall.exe. Click on Install. * It will be installed by default here: C:\Program Files\Trend Micro\HijackThis. * A shortcut to the application will also be placed on your Desktop. * The program will open automatically after installation. * The folder HijackThis is where you will find the HJT logs that you save. * The first time you open HijackThis, check the Main Menu button at the bottom center. When the main menu appears check the box "Show this window when I start HijackThis". * Click on "Do a system scan and save logfile." When the log pops up in Notepad, copy and paste that file back here as a New Message in this forum. The use of HJT is purely for observation please do not try to fix anything with it or you may damage your system. If I see any suspicious files I will advise you to open a new thread in the Malware forum so an expert can help clean up your PC. 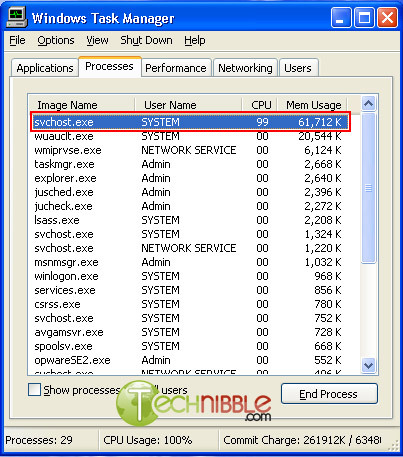 What is the use of svchost.exe service in Windows OS? Why there are so many instance of svchost.exe is running in background of Windows OS? Getting a pop-up error message as “Windows cannot find svchost.exe file”? What does that file used for?